A simple and healthy alternative to ice cream - made in minutes in your juicer. Have you tried out the homogenization screen with your horizontal juicer? Thanks to it, you can make pasta, nut butter, baby food, and of course ice cream. Banana makes the best base for ice cream recipes, and can be combined with many things. This simple recipe uses just chocolate and a little coconut. Replace the juicing screen with the homogenization (blank) screen. That's it. Turn on the juicer and slowly feed the bananas into it. Mix the processed bananas with the coconut and chocolate. Close the container and freeze for a few hours. Just before eating, add colorful sprinkles, nuts, or chocolate syrup if you prefer a sweeter taste. But honestly, banana ice cream is sweet enough on its own. 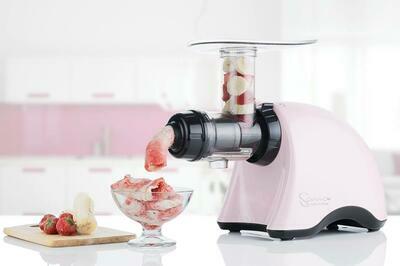 Any horizontal juicer with a homogenization screen (sometimes called a "blank" screen) will make sorbet. We recommend the Sana 707 or Vidia SJ-002. In addition, the Omega Mega Mouth vertical juicer has a special homogenizing screen which makes sorbet and ice cream as well.